The CCLD is updating the list of facilities currently accepting seniors and other residents on their website. Here is a quick list of contacts below from their website. Live Google Maps link of road closures and areas affected by the Woolsey and West Hills Fires. As of November 9, 2018, there are fires developing in Southern California in the Ventura County area. If you are relocating your residents, please contact your Regional Office to provide information about where you are relocating to and provide your census. Applegate @ Dorado 805-207-7791 Non-Operational Short Term Fully Evacuated 3 residents were picked up by family members and the 3 remaining residents were transported to sister facility- Sirius. Atria Grand Oaks 805-370-5400 Non-Operational Short Term Fully Evacuated 85 residents at San Dimas facility; 13 residents at Atria Hillcrest. Brighter Tomorrows 805-383-3669 Non-Operational Short Term Fully Evacuated 11 residents evacuated to Holiday Inn Express in Port Hueneme. Creative Care, Inc. 310-589-9834 Non-Operational Short Term Fully Evacuated 6 residents relocated to a residence in Pacific Palisades 90272. Gerald Home Care 818-219-5998 Non-Operational Short Term Fully Evacuated 4 residents evacuated to Happy Home Care 2 (RCFE), 1273 Sheffield Place, Thousand Oaks. House Of Transition 805-437-2903 Non-Operational Short Term Fully Evacuated 12 residents evacuated to the Holiday Inn Express in Port Hueneme. Leisure Living 818-879-9900 Non-Operational Short Term Fully Evacuated 27 residents relocated to Taft High School, in the gym. 3 residents evacuated with family members. Leisure Living 818-426-0099 Non-Operational Short Term Fully Evacuated 27 residents relocated to Taft High School, in the gym. 3 residents evacuated with family members. Leisure Living Inc 818-879-9934 Non-Operational Short Term Fully Evacuated 27 residents relocated to Taft High School, in the gym. 3 residents evacuated with family members. Leisure Living Inc. 818-879-9944 Non-Operational Short Term Fully Evacuated 27 residents relocated to Taft High School, in the gym. 3 residents evacuated with family members. Leisure Living Inc. 818-879-9988 Non-Operational Short Term Fully Evacuated 27 residents relocated to Taft High School, in the gym. 3 residents evacuated with family members. Mountain View Residential Care 805-498-2743 Non-Operational Short Term Fully Evacuated 4 residents evacuated to Royal Oak Home (RCFE). 1 resident evacuated to home with family at private residence. Starship 805-383-3669 Non-Operational Short Term Fully Evacuated 7 residents evacuated to the Holiday Inn Express in Port Hueneme. Stonehenge 805-383-3669 Non-Operational Short Term Fully Evacuated 15 residents evacuated to the Holiday Inn Express in Port Hueneme. Below is a link with facilities that have indicated they have beds available. Please work with the contact on the list to see to see if their availability is appropriate for your residents. On June 16, WHCOA hosted an Elder Justice Forum. Cecilia Muñoz, Director of the Domestic Policy Council, welcomed advocates, physicians, prosecutors, researchers, government officials and others to the White House to talk about how to best to address and prevent elder abuse and financial exploitation. Participants discussed innovative ideas for strengthening law enforcement and prosecutorial efforts; supporting research and victim services; and preventing and combatting elder financial exploitation. 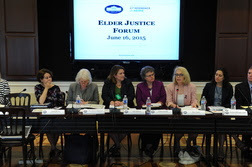 Photo caption: Cecilia Muñoz, Assistant to the President and Director of the Domestic Policy Council; Nora Dowd Eisenhower, Assistant Director, Office for Older Americans, Consumer Financial Protection Bureau; Julie McEvoy, Deputy Associate Attorney General, U.S. Department of Justice; Kathy Greenlee, Administrator, Administration for Community Living, and Assistant Secretary for Aging, U.S. Department of Health & Human Services; Nora Super, Executive Director, White House Conference on Aging; and Caroline Bettinger-Lopez, White House Advisor on Violence Against Women at the White House Elder Justice Forum on June 16, 2015.